It’s been a few years since I’ve put much effort into testing and wearing a new road running shoe, but with a recent increase in road miles, plus a few road races on the calendar this year, it has become apparent that I need a solid road shoe. My main focus has been Altra’s road shoe line, with the One 2.5 being my light and fast, minimal cushioning go-to, and the Torin 2.0 for extra cushioning. I also own an older pair of Paradigms, which I use occasionally for easy recovery runs, but admittedly they collect more dust than miles (sorry guys). But I’ve had my eye on the Instinct 3.5s for a while as a potential every day shoe — something with a little more cushion than the Ones, but a little less than the Torins. So when my friends over at Road Runner Sports offered me a pair to review, I couldn’t pass up the opportunity to give them a shot. So far I’ve logged just over 80 miles on these bad boys, including the wet and rainy Asheville Marathon. More on how they stood up there later. As with all of Altra’s running shoes, the Instinct (and Intuition) utilizes Altra’s foot-shaped toe box, which allows the toes to relax and spread naturally. 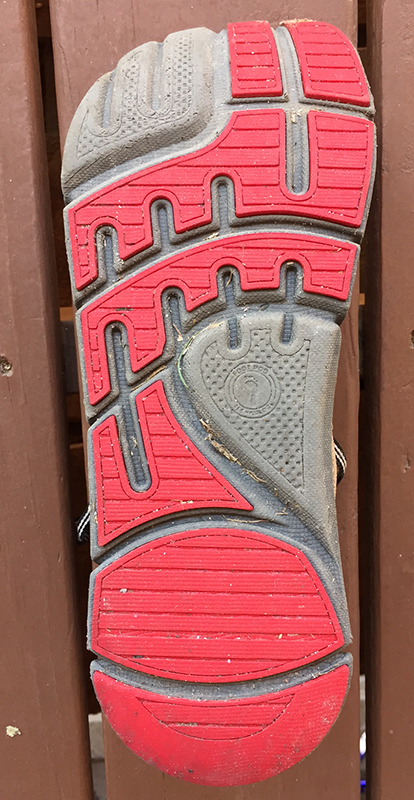 And of course the zerodrop design, where your heel and the forefoot are equal distances from the ground. The Instincts are what I would call average cushioning. For comparison purposes, the 24mm stack height is right around the same as the Saucony Ride (26mm heel) or the Mizuno Wave Rider (28mm heel), but of course both of those shoes have a heel to toe drop, where the Instinct does not. It remains 24mm throughout. For me, this is the perfect level of cushioning for an everyday shoe. While the One is great for races and faster speed work, and the added cushioning in the Torin is nice for long distances, the Instinct offers just enough cushion, comfort, and protection for daily use. Long story short, these kicks are comfortable. They’re light weight and offer just the right amount of cushioning for my preferred daily running footwear. The Instincts hug in tightly across the midfoot, locking your heel and foot in place, while offering plenty of room for your toes in the toe box. As someone who has chronic toe problems, this extra space is crucial. After the wet and hilly Asheville Marathon, I had no sign of the toe issues I’m known to suffer through with a traditional shaped shoe. The mesh-upper is cool, breathable, and quick to dry when wet. The FootPod outsole makes for a comfortable ride. You have decent ground feel in these shoes, but they’re flexible and soft. Like most (maybe all?) Altras, these are designed with a 6th lace hole at the top to utilize the lace lock technique, which I’ve been using since the day it was shown to me (and will never go back if I can help it!). After 80+ miles, there’s very little sign of wear. Aside from the dirt and mud currently caked in to the upper after a wet and muddy Asheville Marathon, they could be almost like new. You’ll notice slight wear on the sole (as seen to the right), but nothing significant, especially for the amount of miles logged. While these are road shoes, and not designed to grip dirt and mud like you’d want in a trail shoe, I’ve been pleased with how well these ride on the trail. Large portions of the Asheville Marathon were on dirt roads, which during the rain, were rather slick. I noticed several people sliding around at times, but felt comfortable and stable in these guys. The one issue I’ve had with the Instincts occurred during that rainy marathon. Around half way through, the left shoe started to make a “squish” noise with every stride until the rain stopped. I’m sure that this was a drainage issue from the rain squishing beneath the insole. Since this was the first time I had heard the issue, I reached out to the folks over at Altra and the Altra Ambassador crew. Apparently I’m the first to report this issue, and considering it only happened on one shoe, it’s probably a non-issue for most customers. Either way, I couldn’t go without including it here. This is one of my favorite looking Altra shoes. The red, black, and off-white mesh look great together, and the design of the mesh upper and funky lace set-up helps the shoe to look less … foot-shaped. It’s a cool design that when cleaned up, I’d wear running or with jeans. This is a great, comfortable road shoe that can handle itself well on buffed out trails. It has become my go-to for the road, and will continue to be in the foreseeable future. So is the Altra Instinct 3.5 or the Intuition 3.5 for you? If you haven’t heard of Road Runner Sports, they are the place to buy running shoes online. Contrary to the name, they also carry a number of trail shoes along with just about every road shoe out there. Plus, for VIP Family members, they have this awesome 90 Day Wear ‘Em & Love ‘Em shoe return guarantee. Yup, 90 days of wearing. You can run in them as much as you want for 90 days, and return hassle free if something doesn’t feel right. Simply use ROCKCREEKRUN16 at checkout and your membership will be automatically added to your cart. Don’t want to be part of the VIP Family? You can still enjoy 10% off today’s order when using ROCKCREEKRUN16 at checkout. Some exclusions apply, so definitely check the site for details. And don’t forget to use code ROCKCREEKRUN16 for 10% off today’s order or 20% off when you join the VIP program.